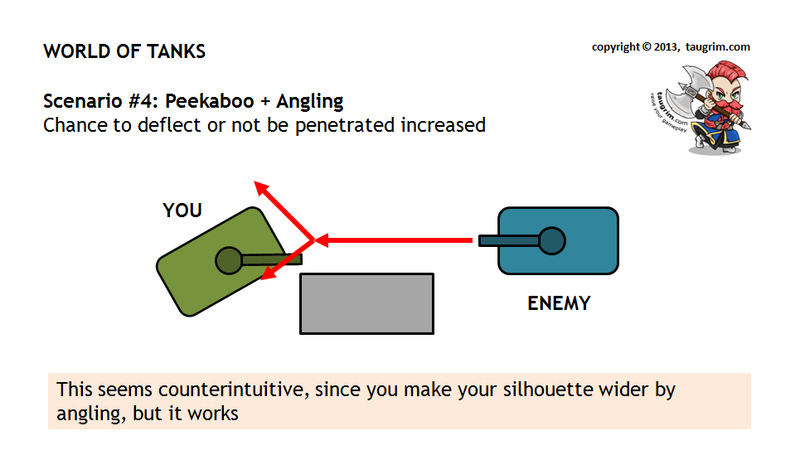 This guide explains the concept of “angling” in World of Tanks (WoT). Angling is turning the hull (body) of your tank so that the front of your tank is pointed slightly to the left or right of your target. 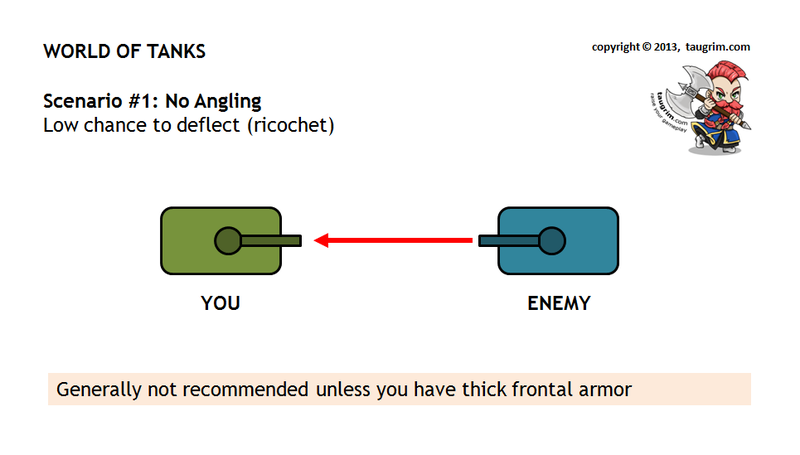 Proper angling increases your tank’s effective hull armor, which can cause incoming shells to ricochet or bounce – i.e. angling increases the probability that a shell fails to penetrate armor. 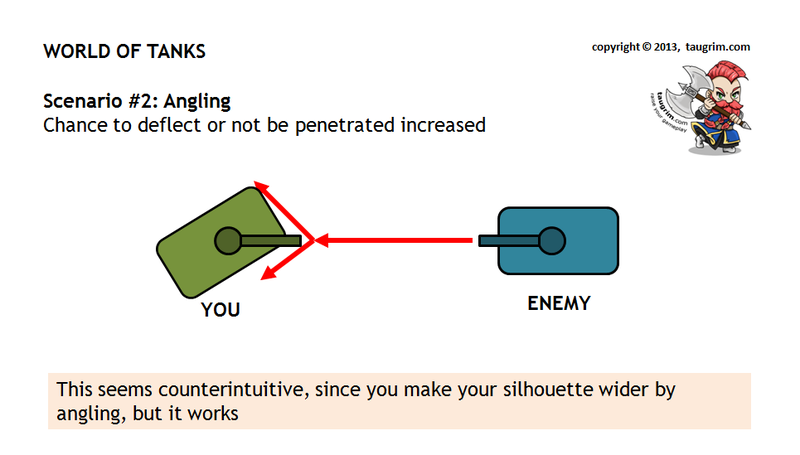 Angling can also cause indecision on the part of your opponent as they debate where to aim. If the strike hits the board straight on as shown in the bottom panel, i.e. the impact angle is 0°, maximum force is applied and the board is more likely to break. The same concept applies to shell penetration in WoT. How Much Do I Angle My Hull? Short answer: it depends on how thick your side hull armor is relative to your front hull armor. As general rule, you want to angle your hull to the extent that you can increase your effective front armor without over-exposing your side armor. Tanks with low armor may not benefit meaningfully from the increased effective armor gained by angling, since increasing a small number won’t matter much, in which case you may want to not angle your hull so that maintain the smallest possible silhouette. 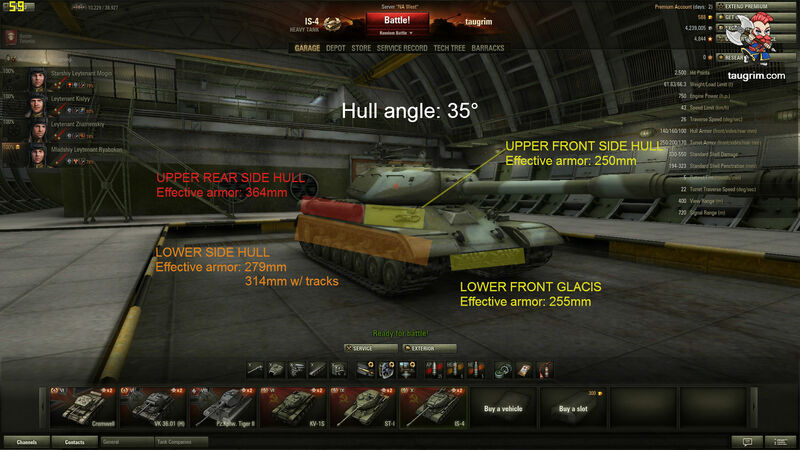 With the earlier table in mind, here are some examples for recommended hull angle when your tank is in the open field without available physical cover, taking into account only the thickness of the front and side hull armor. Longer answer: to determine how much to angle your hull, you need to consider not only the thickness of your front and side hull armor but also the slope and sizable weak spots. For example, the tier 10 IS-4 Soviet heavy tank has a frontal weak spot in the Lower Front Glacis (LFG), which at 0° angling has an effective armor of 209mm and is easily penetrated by most tier 9-10 tanks. However, the IS-4 has thick side hull armor of 160mm, so the driver is able to angle at 35° to boost the effective armor of the Lower Front Glacis to 255mm while still maintaining a high effective armor value of 279mm for the side hull. For more advanced videos, check out my “Road to Unicum” tank reviews in which I share what I’ve learned as I progress towards account Unicum rating (top 1%). I talk through how I’m reading each battle as it unfolds and discuss key decisions and mistakes. My hope is that these videos meaningfully help other players improve their gameplay. The following diagrams illustrate the concept of angling in various situations. As Crueldwarf posted below, another angling technique is “sidescraping” in which you only expose your angled side to the enemy. As a final note, there is a variant of sidescraping known as “reverse sidescraping” where the rear of your tank is what you are covering while sidescraping – you are essentially facing backwards. This technique is only applicable for tanks with strong rear hull armor, such as the KV-5, which has an armor layout of 180/150/140, and for tanks that have obvious weak spots in the front hull armor. Reverse sidescraping requires some time to set up, and it can leave you in a vulnerable position if your enemy rushes at you. AP and ACPR shells are normalized, i.e. they are adjusted towards the armor’s normal axis at the point of impact. In layman’s terms, this means AP and ACPR shells effectively reduce the angle of the armor. AP normalization is 5°, ACPR is 2°. HEAT and HE shells are not normalized. So for example, if an enemy tank is firing AP at your side armor, and the impact angle is 60°, for penetration purposes, your side armor is treated as if the impact angle is 55°. This is a lot of math, but it basically means if your tank has very thin armor, angling won’t meaningfully help. Getting skilled at WoT does require some homework – in particular you need to learn the armor models of tanks, so you understand how to protect them and how to damage them. This incredible site allows you to view the 3D models of every tank in a web browser. You can mouse over various parts of the tank to see the penetration values. You can also rotate the turret, so that you can determine side and rear turret values. It also has an interesting feature which allows you to see the gun depression values for any direction. May be you can add another one variant of angling to the guide? I’ll link your image to the Guide. Anyways not to be mean but most people who used to see your guides dont give a **** about tanks.Good luck with what ever you are doing. WoT is pretty competitive IMO. It’s a very skill-based game. Look, I play games for fun, and I think WoT is a fantastic game. I’ll write about whatever games I’m playing and enjoying. Personally, I wouldn’t play this game, but I appreciate that this is not a GW2 or SWTOR blog, but that you cover all games that you play. And give great info. Keep it up man. I was never interested in it either, then on a whim (because Age of Wushu was such an awful F2P experience), I gave WoT a try, and I was really blown away by how tactical and team-based the gameplay is. but I appreciate that this is not a GW2 or SWTOR blog, but that you cover all games that you play. And give great info. Keep it up man. Of course, I’m really excited and curious about TESO, CU, WildStar, and Neverwinter but those games are in development / Beta so it will be a while yet til we can meaningfully experience them. Hey Taugrim, great post. My feelings are that any post from you about any game you’re playing is a great read. Is there any chance of a post about why you did not like Age of Wushu. I’ve heard it’s kung-fu Eve Online, which for competitive PvP, should be in your wheelhouse. Is there any chance of a post about why you did not like Age of Wushu. Not sure how EVE’s offline skill advancement works, but with AoW you have to pay to be able to develop skills offline or in-game, or you have to play a lot. The controls/UI were clunky and the localization was terrible. This is the kind of experience I expected 5-8 years ago. A lot of people dismiss this game as a simple tank shooter. The depth to this game really lends it to more of a tactical team based shooter. I love that real world strategies and physics take precedence over game mechanics. This game is an MMO by definition. People have come to think MMO and a persistent world are synonymous. That’s a changing way of thinking. Just like how people thought all F2P games were bad until games like this and League of Legends came along. Marketing this as an MMO may be a marketing move to get people to give it a fair try. Anyway, great video. Angling is a great first tip for beginners. Wish someone told me that when I started. I’d love to platoon a few games with you sometime, and I can recommend a great clan that is pretty relaxed when it comes to clan wars. In Eve you buy skill books, using in game currency, which can be earned in many ways an then simply start training them. The skill takes real time to complete and you continue training even when not logged in. It sounds like Wushu is a grindfest. Thanks for the info, and yes, Wushu looks like a grindfest. I didn’t find the combat fun either, and on paper it sounded like it would be good. How friendly is WoT for single players not in a “guild”? I got frustrated and burned out after about a month. If you had few friends, you might be OK. The co-op experience really makes this game shine. I solo a bit still, but running in platoons (groups) is what is really going to show off what the game has to offer. I’ll be glad to run some games with you if you want to try it. FWIW, I solo queue ~90% of the time. You run into the typical issues you’d see in other games, such as players not communicating or coordinating, people leeroying to no useful purpose, etc. But this is a fun game period, solo or grouping. Just like how people thought all F2P games were bad until games like this and League of Legends came along. The definition of MMO is shifting over time, and games like WoT and LoL prove that developers can create F2P games that are high-quality with high replayability. I can recommend a great clan that is pretty relaxed when it comes to clan wars. Our guild hasn’t created a clan yet, we just group up via friends list and talk in Mumble. Although I solo queue ~90% of the time. WoT is decent for Solo player, 99% of my gameplay is solo, just got to learn to follow in packs with the other tanks. Yes, Taugrim, WoT is an underrated game, I thought the same thing about 2 years ago. I told myself why would I play a slow pace Tank shooter. When I finally decided to DL it and play it (I was burnt out on various MMOs at the time) after about a month, I was throwing Monthly Premium accounts at WG. Now, I have not been on WoT since the 8.1 (they are at 8.5) patch, because I got accepted into WG’s closed beta for WoWp and have been helping and enjoying my time with WoWp, so much that I do not find time to play WoT. Sometimes I stay away from the pack, if it looks like we’re leaving a flank undermanned or leaving our arty’s uncovered. It’s awful when SPG’s are not protected and they get easily picked off by scouting light tanks. I told myself why would I play a slow pace Tank shooter. When I finally decided to DL it and play it (I was burnt out on various MMOs at the time) after about a month, I was throwing Monthly Premium accounts at WG. Same for me, except I haven’t paid a penny yet. I’ve been trying to see what the experience is like for a player who isn’t playing. I’ll post about my experience. To me, I think it gets too much of a Grind around Tier 6+ as a free account. I do not know if this has changed since I have not really been on since June 2012 because I have been in WoWp Closed Beta testing that for WG. Yea, you and Traitine said the same thing. I decided to subscribe as Premium, to speed up the rate of XP and credit earning. It made getting through Tiers 3-5 in the Soviet line to get my KV-1 pretty quickly. I’m sure at 6+ the grind significantly increases, based on the XP / credit costs. It hasn’t changed. It is very grind happy in tier 7+. I’m having fun though, taking it slow and playing SWTOR and GW2 alongside it. I’d find it hard to make this a ‘main’ game between tiers 6 and 10 without premium. I’m enjoying working my way up through different tanks. I got my KV-1 this weekend, and I surprisingly enjoyed the T-28 Tier 4 Soviet medium tank, despite it’s quirks (thin armor, big silhouette) because of the mobility and excellent gun. It’s a good overall technique for reducing incoming damage, but it also runs the tactical risk of having a more experienced tank driver aiming for your treads instead, which could result in an entirely different slew of problems for you. Not that most people can aim that quickly and that well, but it is a slight risk that people should know about, especially when they’re up against a player with good aim. I just thought that I’d quickly mention it. I do tend to angle anyway, for the mitigation/avoidance while I (hopefully) am penetrating the target. Oh my! Taugrim is playing WoT’s! Platoon with me!? My side was winning the battle, as we had 5 remaining tanks and just you on the other side. I figured we had the battle in the bag and stayed to watch the remainder of it even though you killed me and my guildee TrajanMVN. What happened is that you 1-shot each of the remaining 5 tanks. With 4 tanks left, I tried to tell the remaining allies that you were probably running the derp gun + gold ammo on your M4 and that they should be careful, as that combination provides incredible firepower, but they weren’t listening or comprehending – e.g. see the comment in the screenie. At any rate, assuming you were gold rounding – I hope you understand I’m not picking on you. You just happened to be the best example TrajanMVN and I had seen in our time in WoT of the impact of gold ammo. I read your forum post over on the WoT forums and agree with what you wrote – attitude and making the effort to improve one’s gameplay are the biggest factors in improving one’s performance, instead of taking the easy path of whining. It’s great that you took the time to share your thoughts about it. And I appreciate your linking to this guide in it! You’ve been playing WoT for longer than I, so I’d be curious to hear your thoughts on the various changes coming in 8.6. I’m very curious to see how the improvements to accuracy in 8.6 will affect gameplay. It should make hitting weak spots much more easier, in which case players who know where to aim on a given tank should be able to do better. Yes! That was my first kolobnovs (Stand up to five tanks alone and survive) medal and it will be forever tainted by the M4 and gold rounds. I agree with you 90% about gold rounds. HEAT rounds are far to effective on many guns, the 105mm howitzers being a prime example. It gives tier 5’s more DPM than any tier 8 tank. However, Wargamming seems to be dialing back the effect of premium shells and emphasizing the exploitation of weak spots. Which is great. I’m on the fence about removing gold rounds entirely. They add an extra element to managing your economy. Yes non premium players will have to grind a little longer and be more careful in the use of gold shells but they can still afford to use them. I would be okay with the out right removal of premium shells, hell it’s probably the best thing for the game. I’d just miss some of the other effects. For example, APCR rounds have a higher velocity even though their pen drops off faster over range. This helps with hitting fast moving scouts. I believe Wargamming is making a good effort to lessen the power gap between paying and free players. Heck, I think it was in 8.3 or 8.4 that they made it so that you could buy gold rounds for credits. No one knew how over powered the 105mm HEAT shells were before that because no one ever bought gold ammo for it. As exciting as the HEAT and accuracy changes are I’m most exited about the others. -The nerfing and standardization of camo in general. Bushes and trees won’t provide the same amount of extra camo. This is HUGE. I mention in another comment that mastering and abusing the vision/camo mechanics are critical to success in high level gameplays because they’re the only mechanics that don’t rely on RNG. I’m VERY excited to see how this change effects the meta game. -Gaining experience for damage done to vehicles you track. This is awesome! Suddenly a good player is rewarded a lot more when he’s bottom of the tier and can’t pen tanks frontally. A lot of strategy in platoons involves isolating and tracking tanks at the right time. -Arty nerfs. You haven’t gotten to high tier game play yet but in tiers 8+ arty is a piss poor mechanic that encourages camping and turns open maps in to very static boring ones. Wargamming seems to be trying to ween players off arty. Thank you so much for the kind comments on my guide. It was actually more an attempt to inject a little levity into forums that are a bit to serious and toxic for their own good. It’s funny, after I stopped playing GW2 I also stopped visiting your blog. When writing that guide I was look for a good angling tutorial to link with it and lo and behold I found your blog again. Such an awesome well produced yet simple to understand guide you wrote. The WoT’s community needs more like it. I looked up your stats last night and was so jealous of how well you’re doing. I played WoT for about 3500 games before quitting, I did terrible with a 51% win rate. I then moved on to SWTOR and discovered your key-mapping guide through The Republic. Following your blog and watching the Republic and you changed the way that I approached gaming. I used to just lazily herp derp my way through games not caring about my own performance. Now after coming back to WoT’s I’m rocking a 55% win rate! You turned me into a competitive player and I thank you for it. I’m sorry for the bad formatting and any errors, I’m in a rush to get out of the house. Seriously hit me up on WoT’s if you ever need a platoon mate. It would be an honor. Well, it is a rare achievement, and gold ammo or no. And it requires some bad judgment on the part of the 5 – especially when they’re rushing in for the final kill instead of realizing what’s happening or comm’ing on chat. Re: the economy, so long as a player is actively unlocking new tanks, buying mounted equipment, even with Premium they are going to not have a lot of extra credits sitting around. That changes if a player stops unlocking new tanks – what does the player do with their credits? Yet I think a more reasonable balance could be made here. E.g. if gold rounds provided 10% higher penetration than the regular ammo, that would be a significant advantage in my opinion. The difference between, say, 120 pen and 132 pen will make a difference, especially when the gun and target armor are closely matched. What you’re talking from a conceptual perspective is incomparables. Players can spend to have more choice on what their “gear” is – but there are associated tradeoffs with each set of ammo. That would be a far better implementation – give players choice, but don’t make ammo a P2W experience. I’ve read a bit about this but not clear what the implications are. I’ll reserve judgment til I see it live. Gaining experience for damage done to vehicles you track. This is awesome! Suddenly a good player is rewarded a lot more when he’s bottom of the tier and can’t pen tanks frontally. A lot of strategy in platoons involves isolating and tracking tanks at the right time. Agree 100%, and this will support / encourage good teamplay. Arty nerfs. You haven’t gotten to high tier game play yet but in tiers 8+ arty is a piss poor mechanic that encourages camping and turns open maps in to very static boring ones. What I find ironic up through Tier 6 tanks (so I face Tier 8’s) is that when games don’t have arties, there tends to be a lot more movement. 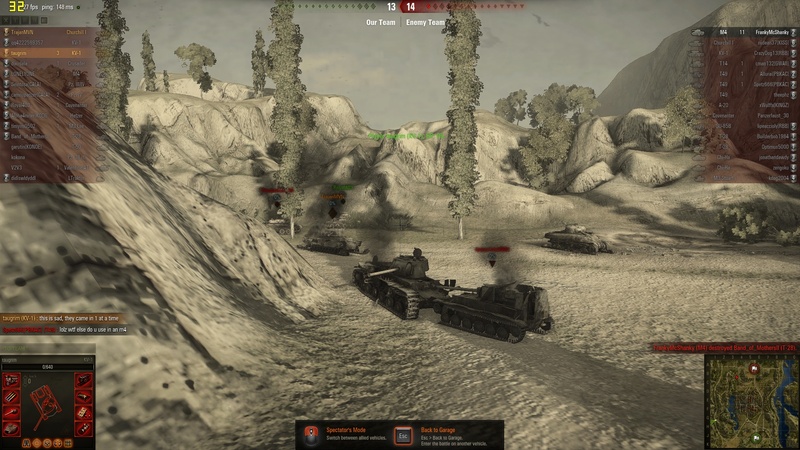 I would have expected arty-free games to have more camping, but instead players seem more comfortable venturing out from cover, since they only face nearby tanks, not those tanks + the arties who are across the map. Well, you hit on a theme which is part of what got me blogging in the first place: stop whining about things you can’t control, and focus constructively on what you can: your own gameplay. That really is what got me writing guides in the first place – reading all the (inaccurate) claims that such and such a class was broken, or a build was broken, etc. Truly some classes are OP’d and some are UP’d in a given game in a given context (PVP, PVE, solo farming, etc), but at the end of the day a lot of the UP classes are functional if played well. It’s funny, after I stopped playing GW2 I also stopped visiting your blog. When writing that guide I was look for a good angling tutorial to link with it and lo and behold I found your blog again. Such an awesome well produced yet simple to understand guide you wrote. The WoT’s community needs more like it. I wrote it partly because I was seeing a lot of players not angling or never angling, even though it’s something people talk about a lot. So I figured showing some illustrative footage and diagrams would be helpful. I looked up your stats last night and was so jealous of how well you’re doing. I played WoT for about 3500 games before quitting, I did terrible with a 51% win rate. FWIW, 51% WR is actually very solid, ~2% above the average, which is statistically significant. I then moved on to SWTOR and discovered your key-mapping guide through The Republic, Following your blog and watching the Republic and you changed the way that I approached gaming. I used to just lazily herp derp my way through games not caring about my own performance. Now after coming back to WoT’s I’m rocking a 55% win rate! You turned me into a competitive player and I thank you for it. Your 55% WR maps to ~97th percentile, which is outstanding. But honestly a big part of simply doing better is having a consistent desire and focus to do well. I go through spurts where I’m just slogging through games instead of really thinking about what I’m doing, and trying to have a good time. That is one danger with WoT – it takes time to grind out new tanks, and one can simply just cruise and not really focus. Thanks for taking the time to share your thoughts and experience. We’ll have to platoon when 8.6 launches, I’ll be interested to hear your perspective as a more experienced player who has seen the game evolve. Maybe it’s my near religious abuse of these sells that keeps me from worrying about the economy too much. Agreed. Wargamming needs to eliminate any pay to win perception as well as tighten up the RNG. Can you say competitive WoT e-sports!?! Exactly! The implications are very unclear there is little info about the actual change. It excites me because it’s so mysterious and has the potential to radically change the way we play certain maps and tanks. What I find ironic up through Tier 6 tanks (so I face Tier 8′s) is that when games don’t have arties, there tends to be a lot more movement. There was a hilarious picture that describes my feelings on the subject pretty well. I’ll try to find for you. 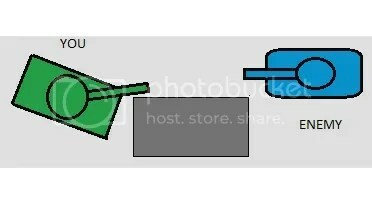 It has a Matador (with a medium tank icon above his head) fighting a bull (with a heavy tank icon above his head) and an guy with a rocket launcher sitting in the cowd (with an arty icon above him). Yep! This irks me so much. The thing is that I don’t mind when people abuse their overpowered build/class. I just hate when they try and defend it. Heck, look at me abusing the heck out of the 105mm on the M4 but I’ll jump for joy when it gets nerfed. I wish people would understand that those things are bad for the game. Well that’s the thing. You taught me to approach gaming in a mature and deliberate fashion. To think about what I’m doing and why in an intelligent manner. And I REALLY hope that “blockquote” thing works. As far as the economy is concerned have you taken note of the special events they have nearly every weekend? Ah yes, I had forgotten to take those events into account. So far there have been two weekends with events over the month I’ve been playing. The most recent 5x weekend is what made it possible for me to quickly grind through my T-150 and KV-1S. Searched on Google, couldn’t find it. I learned my lesson with RIFT patch 1.5 that some people simply lack objectivity and are more concerned about their class OPness than what is genuinely good for the game. It did for the most part, I had to insert a closing blockquote to have it formatted correctly. Updated the guide: added tables with hull angles, impact angles, and effective armor values. I am slightly baffled by the example at about 3 minutes into the basic video. You are shooting a KV1. I think the KV1 has similar if not slightly better armour and more alpha damage and pen than a Matilda, So if all was equal he should probably grind you down or at least come out near even. But you are angled so you win (point of the video). But it looks like he is angled roughly the same as you, he is certainly not head on. So how comes angling saved you and not him? One on one, a KV-1 should wreck a Matilda. I was using that example to show that even a high-penetration of 120 from the KV-1 can be bounced by a Matilda with proper angling. My Matilda was angled at 45 degrees, which is ideal given that the front and side hull armor are about equal (75/70). That KV-1 was taking fire from multiple tanks, and I got the kill shot because it was too flat (over-angled) relative to my tank, so it was easy to penetrate. hello, i am a wot clan commander. i have been in this mmo since 7.2. we , as a clan, have enjoyed your posts, thank you for your time in sharing these tips in a format that i use for our new guys, in training. you are a true gamer………one who shares the ins and outs of a game, with outrecompense, simply because of…the game. i have been gaming in wow, and eve, and others since the beginning. i am an old gamer, been at it since 1982, first time i played mechwarrior on a tandy 2000 cpu…..lol. thanks for all your posts and training tips…you rock dude. It really depends on the armor layout of your tank. For some tanks (e.g. ST-I, IS-4, Maus), you can significantly expose the side armor because it is so thick. What I recommend you do is install TankInspector and look for particular tanks what the optimum angle is for not over-exposing your side armor but still providing some protection for your front hull armor.